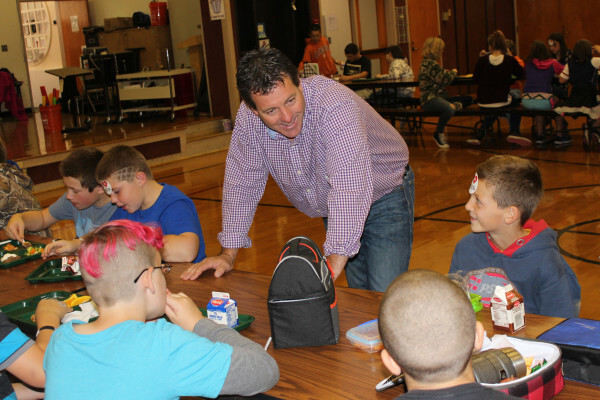 Newburgh dairy farmer Heath Miller talks with Beech Hill School students and answers their questions about milk and dairy farming during National School Lunch Week. Miller is a board member on the Maine Dairy and Nutrition Council, which recently awarded the school grant funds in order to purchase a new milk cooler. Orrington dairy farmer Jim Howard visits students at Center Drive School, handing out cow pencils and answering their questions about milk and dairy farming. A dairy farmer funded grant is responsible for the new milk cooler seen in the background. The school's old one was struggling to keep milk cold. The school food service staff at Ella P. Burr School is excited about their new milk cooler. The old one was leaking coolant, and the temperature was not constant. Pictured from left to right are Lindsay St. Laurent, Olivia Mushrow, Jane Clifford, Patty Jordan, School Nutrition Director Lisa Morin and Denise Jones. 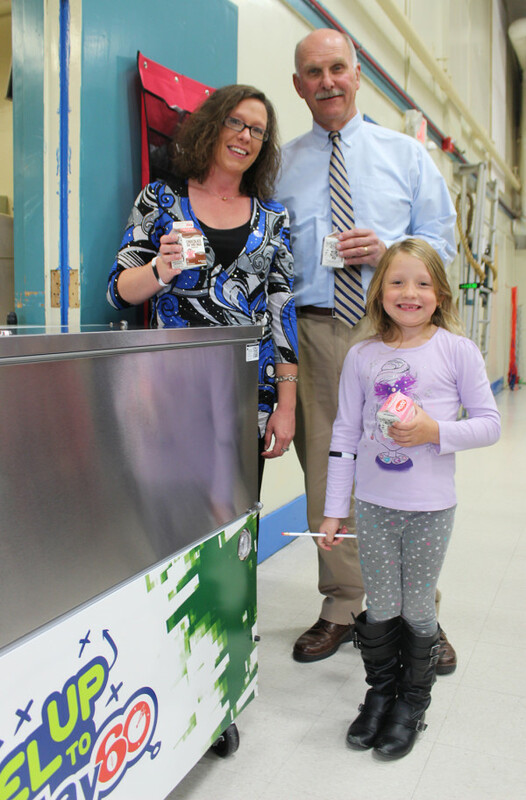 School Nutrition Director Lisa Morin, RSU 67 Superintendent Dr. Keith Laser, and Morin's daughter Izzie, a kindergartner, with their milk that now stays cold thanks to the school's new milk cooler. Having cold milk with lunch would seem a given for school cafeterias, but due to aging equipment, some schools have struggled to do that. 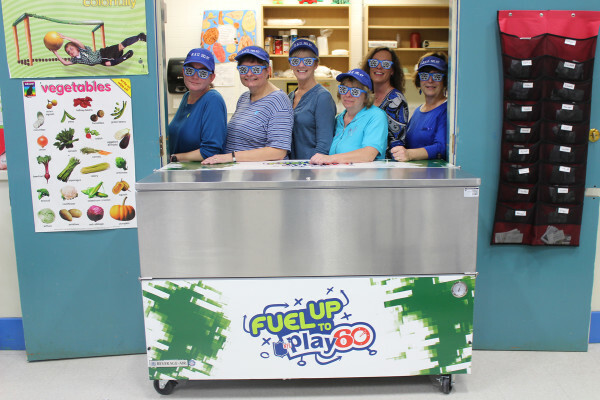 Recently, the Maine Dairy and Nutrition Council (MDNC) and its Fuel Up to Play 60 program, funded by Maine dairy farmers, awarded six Maine schools grant funds to purchase new milk coolers. Included among those schools were three in the greater Bangor area – Ella P. Burr Elementary School in Lincoln, Center Drive School in Orrington, and Beech Hill School in Otis. 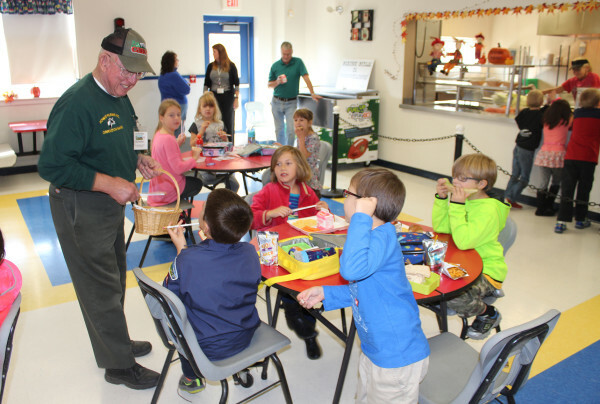 As Oct. 11-14 was National School Lunch Week and October is Farm to School Month*, representatives from MDNC visited those schools during lunchtime to celebrate the new coolers, hand out fun dairy-related items and answer questions about milk and dairy farming. Dairy farmer Jim Howard joined them at Center Drive School on Wednesday, and Heath Miller of Green Valle Farm in Newburgh was able to attend Beech Hill School on Friday. In February, the USDA and National Dairy Council announced the availability of a total of $35 million in federal and private grants to help schools upgrade their kitchen equipment and infrastructure. Eligible school districts nationwide had the opportunity to apply for funds to support the purchase of large and small items including utility carts, utensils, large-capacity food processors, industrial scales, steamers, freezers, etc. Since 2009, USDA has awarded $215 million in school nutrition equipment grants. USDA provides this funding to states, which then competitively award grants to school districts in order to purchase necessary equipment, giving priority to high-need schools where 50 percent or more of the enrolled students are eligible for free or reduced price meals. This year, National Dairy Council and its network of local Dairy Councils across the country, joined USDA’s effort by providing an additional $5 million through a separate, but concurrent, grant application process. In Maine, a large number of schools applied with a variety of needs. In whittling down the selections based on available funds, the Maine Dairy and Nutrition Council looked at the most basic of needs – keeping milk cold. “Our old one was held together with a bungee strap,” said Beech Hill School’s Food Service Manager/Administrative Assistant Liz Flood. School Nutrition Director Lisa Morin of Lincoln said it was “touch and go” with the school’s old milk cooler. Milk had to be kept in a separate cooler until lunchtime because the temperature was never constant with the milk cooler. “In regards to our budget, salaries and food come first. There’s never enough left over to upgrade equipment. This is a huge help,” she said of receiving the new cooler. Under the leadership of President Obama and Secretary Vilsack, USDA has made significant and transformative investments in the lives of Americans living, working and raising families in the United States. In the area of nutrition, since 2009, USDA has made significant progress in maximizing the ability of our nutrition programs to fight hunger and improve health, while also ensuring that benefits are delivered efficiently and with integrity. USDA’s implementation of the historic, bipartisan Healthy, Hunger-Free Kids Act of 2010 has led to more than 98 percent of schools meeting updated, science-based nutrition standards for school meals, as well as ensuring that more than 50 million children have access to a healthier school food environment. The Maine Dairy and Nutrition Council is a non-profit, USDA qualified, nutrition education organization established in 1949 and funded by Maine dairy farmers and processors. As an affiliate of National Dairy Council, our staff works closely with Dairy Management, Inc and MilkPEP to extend nutrition education programs to health professionals, schools and media here in Maine.